You are here: Home / News / News / Toy Soldier of the Week: Tinker the Paper Lord!! Toy Soldier of the Week: Tinker the Paper Lord!! 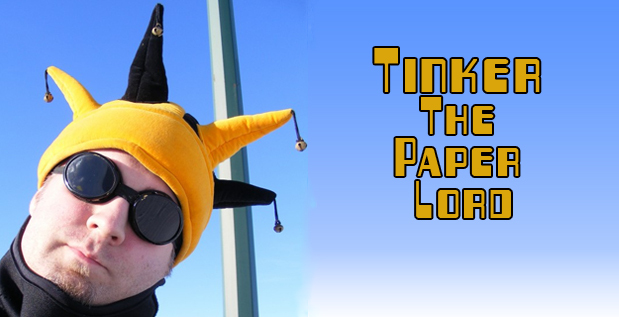 This week’s Toy Soldier of the Week is our very own Tinker the Paper Lord! He has been working hard again to bring us yet another fun mission! Tinker has come up with Instant TS Arm Bands! These are a fun new way of spreading propaganda and also double as a quick way to put the logo on and support/represent Toy Soldier Unite in a jiffy! We are always amazed by Tinkers propaganda crafts here at TSU and he always manages to come up with something new and inventive that we can all do easily. His mission ideas are so great that many have made it’s way to our missions area! Next Next post: Halloween and a TSU-TV Special!